Up for sale is the MAY 1973 issue of "THE BIG BOOK OF WRESTLING" Magazine! "THE BIG BOOK OF WRESTLING" MAGAZINE! MAY 1973! THE BIG BOOK OF WRESTLING MAGAZINE FROM NOVEMBER 1977 FEATURING KEN PATERA. OVER 60 pages, AND WRESTLING NEWS FROM 1976 W.W.W.F. EDITION NO 39. FEATURING A STRONGBOW AND WHITE WOLF COVER WITH 48 PAGES. BIG BOOK OF WRESTLING NOV 1972. MAGAZINE IS IN GOOD CONDITION OVERALL FOR A PUBLICATION OF THIS AGE. Nice addition to any collection - nostalgic reading. 1977 The BIG BOOK of WRESTLING MAGAZINE. This item is a must have addition to any collection. 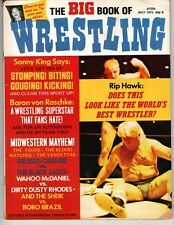 Vintage Wrestling Magazine Lot: The Big Book Of Wrestling May 1975. Condition is Very Good. Shipped with USPS Media Mail. January 1978. September 1977. November 1977. Lot of 5. The Big Book Of Wrestling 1976/1978 November 1976. Ernie Ladd September 1976 Jimmy Valiant July 1976 Jackie west May 1976. Sheik November 1978. Earl Maynard All magazines are used. In good condition. Normal wear for its age. No major rips or tears. No missing pages. Great color. From a pet free smoke free home. Priced to sell. You will receive item shown in scan, Any Vertical lines are an artifact from scanning. BIG BOOK OF WRESTLING VINTAGE JANUARY 1977. Condition is Very Good. Shipped with USPS Media Mail. The BIG Book of Wrestling July 1975 Jack Brisco, Dusty Rhodes. Condition is Very Good. Shipped with USPS Media Mail. REAL NICE CONDITION. Everything else is weight based. The Big Book of Wrestling January 1976 magazine Andre the Giant/Chief Strongbow. Condition is Acceptable. Shipped with USPS Media Mail. BIG BOOK OF WRESTLING JULY 1973 PENNY BANNER GREAT MEPHISTO VICKI WILLIAMS WWWF. Condition is Very Good. Shipped with USPS Media Mail. 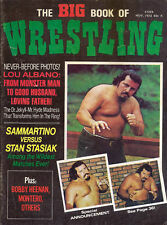 Collectible issue of The Big book of Wrestling from May 1977. WWE Magazine Big Book Of Wrestling May/June 2009. Condition is Very Good. Shipped with USPS Media Mail. THE SHEIK, CHIEF JAY STRONGBOW, JIMMY VALIANT, VICTOR RIVERA, PEDRO MORALES, IVAN KOLOFF. BIG BOOK OF WRESTLING SEPTEMBER 1972. MAGAZINE IS IN VERY GOOD CONDITION OVERALL FOR A PUBLICATION OF THIS AGE. Up for sale is the JANUARY 1975 issue of "THE BIG BOOK OF WRESTLING" Magazine! "THE BIG BOOK OF WRESTLING" MAGAZINE! JANUARY 1975! Up for sale is the JULY 1973 issue of "THE BIG BOOK OF WRESTLING" Magazine! "THE BIG BOOK OF WRESTLING" MAGAZINE! JULY 1973!